Yet Daniel's successes and his failed defense of Kiev attracted the further attention of the Mongols. 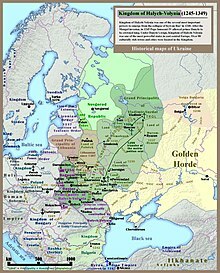 In 1246, he was summoned to the capital of the Golden Horde at Sarai on the Volga River and was forced to accept Mongol overlordship. According to the Ukrainian historian Orest Subtelny, Daniel was handed a cup of fermented mare's milk by the Mongol khan Batu and told to get used to it, as "you are one of ours now." They exchanged hostages whereby 100 families of Keraites were re-settled in Carpathian Galicia. What's the good word on Daniel of Galicia?